As with many Jewish holidays, food plays an important role in Purim. From eating hamantaschen and having a drink (or two) to observing the Fast of Esther, this holiday is full of food customs. The day before Purim some Jews observe a minor fast day known as the Fast of Esther. The word “minor” has nothing to do with the importance of the fast but rather refers to the length of the fast. Unlike other fasts that last for 25 hours (for instance, the Yom Kippur fast), the Fast of Esther only lasts from sunrise to sunset. During this timeframe, both food and drink are off limits. The Fast of Esther comes from the Purim story in the Book of Esther. According to the story, once Haman had convinced King Ahasuerus to kill all the Jews in his realm, Queen Esther’s cousin, Mordecai, told her of Haman’s plans. He asked her to use her position as queen to speak with the king and ask him to annul the edict. However, entering the king’s presence without an invitation was a capital offense, even for the queen. Esther decided to fast and pray for three days before speaking with the king and asked the Mordecai and other Jews in the kingdom fast and pray as well. In commemoration of this fast, the ancient rabbis decreed that Jews should fast from sunrise to sunset the day before Purim is celebrated. There are three explanations for the triangular shape of hamantaschen. 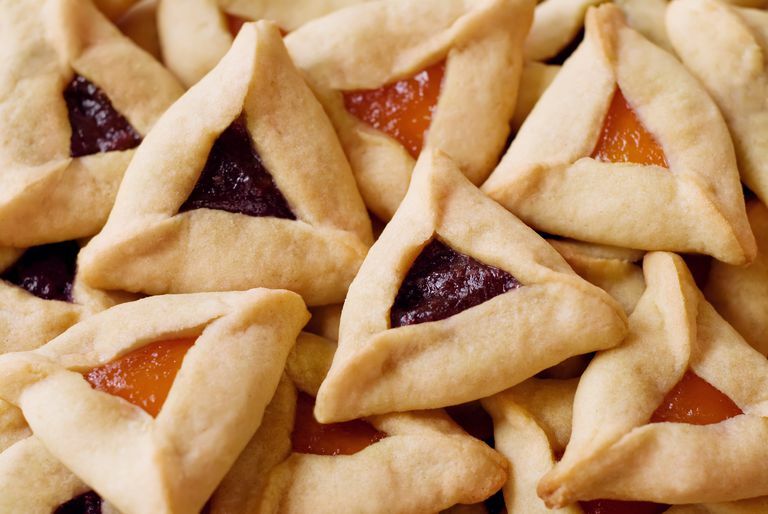 Some say they represent a triangular-shaped hat worn by Haman, the villain in the Purim story, and that we eat them as a reminder that his dastardly plot was foiled. Others say they represent Esther’s strength and the three founders of Judaism: Abraham, Isaac, and Jacob. Yet another explanation applies only to “oznei Haman.” When called by this name, the cookies make reference to an old custom of cutting off the ears of criminals before they were executed. Whatever their name, the reason behind eating hamantaschen remains the same: remembering how close the Jewish people came to tragedy and celebrating the fact that we escaped. Mishloach Manot are gifts of food and drink that Jews will send to other Jews as part of their Purim celebration. Also called Shalach Manot, these gifts are often packaged in decorative baskets or boxes. Traditionally, each Mishloach Manot basket/box must contain two servings of different kinds of food that are ready to eat. Nuts, dried fruit, chocolate, hamantaschen, fresh fruit, and bread are common items. These days many synagogues will organize the giving of Mishloach Manot, relying on volunteers to help prepare and deliver the packages that congregants order for their family, friends, and neighbors. Telushkin, Joseph. "Jewish Literacy: The Most Important Things to Know About the Jewish Religion, Its People and Its History." William Morrow: New York, 2001.